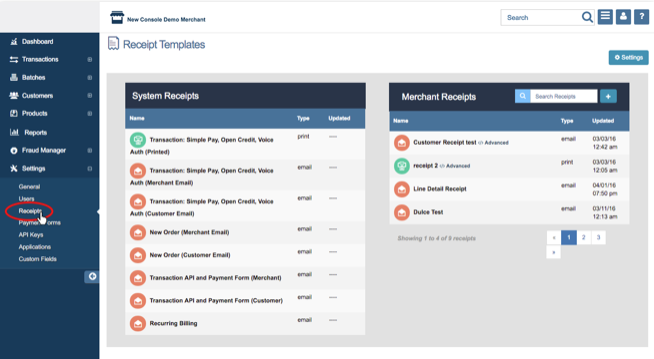 The Merchant Console allows you to create and choose templates for your receipts. A receipt will be sent out to the customer every time a transaction is processed. 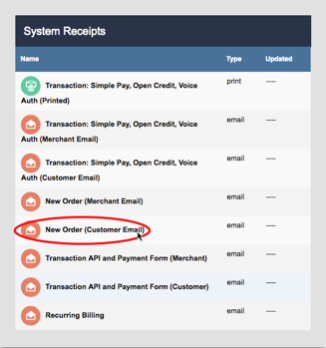 Customized (Merchant Receipts) and default (System Receipts) receipt templates can be accessed in this section. To access Receipt Templates, click on ‘Settings’ from the side menu bar then select ‘Receipts’ from the drop down menu. 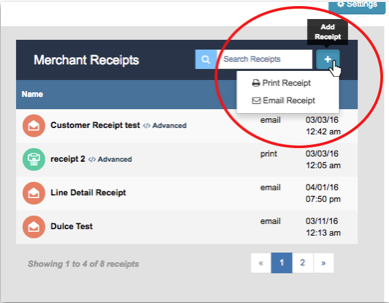 System Receipts are default receipt templates included in your merchant account. You can edit and customize each system receipt’s information and content. Follow these steps to customize a system receipt. Please Note: You cannot delete system receipts. The System Receipts table shows all your default receipt templates included in your merchant account, the type of the receipt (an email receipt or a print receipt), and the date it was last updated. Click the receipt you wish to edit from the System Receipts table. For example, as shown in the image, a merchant chose to edit the ‘New Order (Customer Email)’. 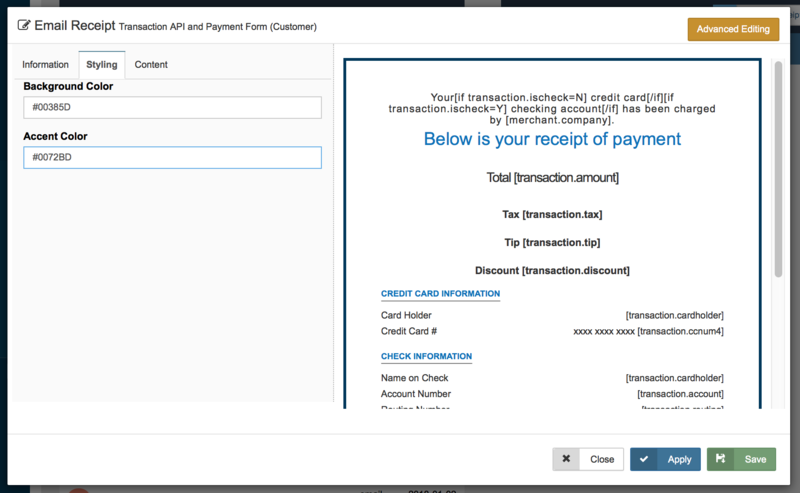 A pop up window will appear where you can edit the receipt information, styling, and content. This tab lets you enter the receipt’s information: Name, Email Address, and Email Subject. The right side of this tab shows a preview of your receipt. To include a logo on the receipt, turn the switch to and to remove the logo, turn the switch to . Click and proceed to the next step. 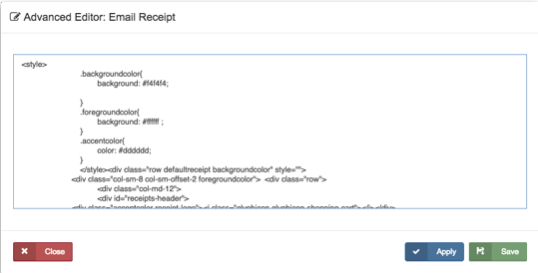 Edit the style of your email receipt template by customizing its Background and Accent Color. To edit the color for each, click the color field. 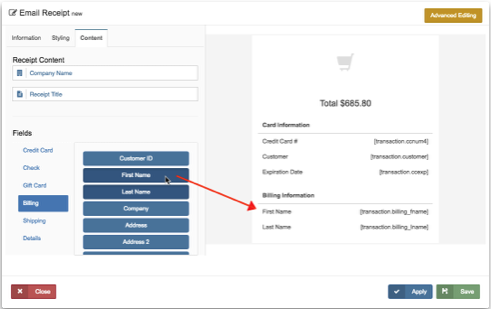 Enter your Company Name, Receipt Title, and the fields that will appear in your receipt. To add a field, click on the field button. This field will automatically be added to your receipt template. See image below. 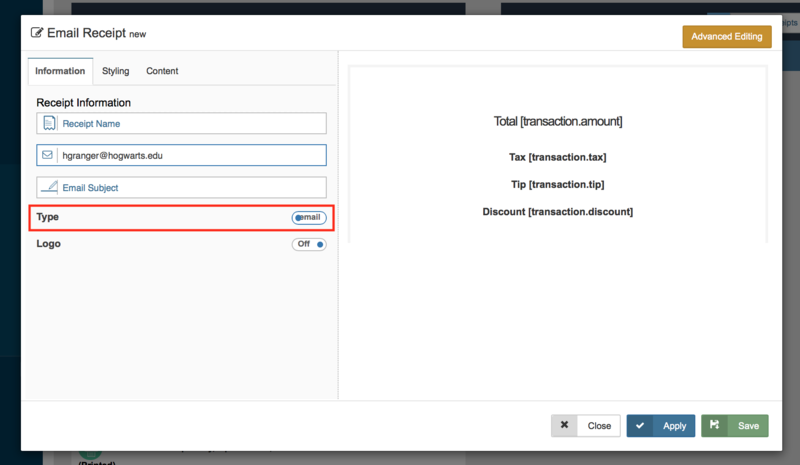 Once you are done configuring the receipt template’s information and settings, click . You will be taken back to your Receipt Template page. The merchant console allows all merchants to create their own merchant receipt templates. To create your own receipt, follow the steps outlined below. The image below shows the templates for merchant receipts. Click the button on your ‘Merchant Receipts’ table. Select the type of receipt template you want to create: Print Receipt or Email Receipt. This tab lets you view and edit the receipt information: Name and Email Subject. Enter your email address in the ‘Sign Up With Your Email’ field. The Receipt Name and Email Subject are named for you by default. Change the type of the receipt by switching the button to . Please Note: The ‘Styling’ tab will not appear when you choose to switch the receipt type to ‘Print’. Click and proceed to Step 4. Enter your Company Name, Receipt Title, and the fields that will appear in your receipt. To add a field, click on the field button. This field will automatically be added to your receipt template. Refer to the image shown below. Once you are done configuring the receipt template’s information and settings, click You will be taken back to your Receipt Templates page. Once you have completed the Step 2 for editing a Merchant Receipt, you have the option to switch to 'Advanced Editing' mode. Please Note: This is only recommended if you have experience with html. To use the ‘Advanced Editing’ feature to customize your receipt template, click on . A pop up window will appear to confirm that you want to continue. If you choose to continue, you will then be taken to the HTML editor window. Please Note: Once you begin editing within the Advanced Editor, you will no longer be allowed to return to the drag and drop editor. Once you are done editing with the Advanced Editor, click . You will be taken back to your Receipt Templates page. To search for a specific receipt template, enter the receipt template name on the ‘Search Receipts’ field then hit ‘Enter’ on your keyboard. 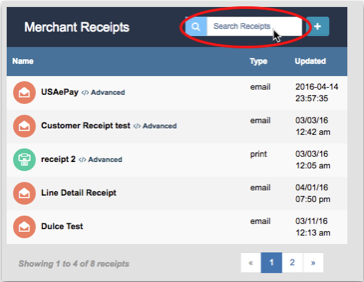 The Merchant Receipts table will automatically update with the receipt(s) that match the criteria entered. 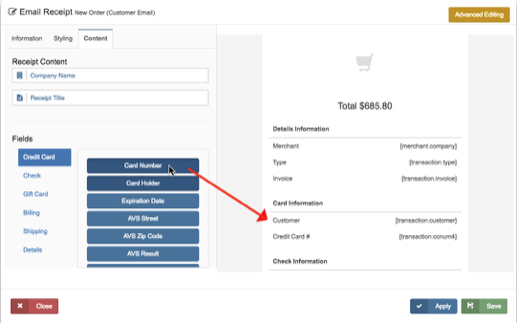 The Receipt Settings allows you to configure the header of a customer’s email receipt. Click on located at the top right hand side of your Receipt Templates page. The Receipt Settings pop up window will appear. Email From: Enter the email address you would like to appear in the ‘Email From’ section. Entering an email address in this field will prevent the customer from receiving an emailed receipt from an unfamiliar email address. You may only enter ONE email address in this field. Email To: Enter the email address you would like your customers to reply to, in the event that they have any questions or concerns regarding their order. You may only enter ONE email address in this field. Subject Prefix: This setting allows you to add a prefix to the automated subject line of the email, in order to clearly identify the receipt for your customers. It is recommended that you use something simple, such as your company name (eg. ABC Company Customer Receipt), so that customers can easily identify the origin of the email receipt. 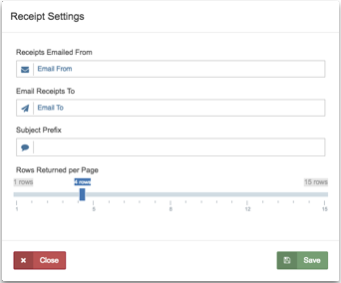 Rows Returned Per Page: This setting sets the number of rows that will appear by default in your System Receipts and Merchant Receipts tables. You can choose the numbers of rows by using the slider or by entering a specific value on the number field.